As a child, I anticipated the Thursday of the Masters almost as eagerly as Christmas or a birthday. I couldn’t wait for the first azalea-filled trailers to appear on the BBC and, for weeks prior to the tournament, I’d repeatedly watch video recordings of past competitions as well as spending hours chipping around the garden imagining I was Seve Ballesteros. That was in the late 1980s and early ‘90s when Augusta was a playground for the Europeans: Sandy from the bunker then Faldo twice, Woosnam, Langer and Olazabal. It seemed every year you could, pretty much, guarantee a battle down the stretch between your favourite players. For the last few seasons, I’ve become increasingly neutral about the year’s first Major. Perhaps I’m just getting cynical as I get older or maybe it’s true that Hootie’s “Tiger Proofing” had diminished the spectacle. Either way, I have to confess: I wasn’t terribly excited by Zach Johnson’s (and God’s) over-par victory in 2007, nor by Trevor Immelman’s limp over the line last year. As the winter season came to a close and the daffodil shoots began to emerge through the detritus in my back garden, I waited to see if I would feel any of the old shivers of excitement about the approach of the 2009 Masters. I’m delighted to say I did and that now, on the Thursday morning, I’m approaching a level of fever pitch. There are a number of reasons why this year’s contest has me on tenterhooks. Tiger vs Phil – Following his return from injury, Woods has already won a tournament and his long game looks stronger than ever. He’s been displaying outrageous confidence in the pre-tournament press conferences so it’ll be fascinating to see if he can live up to everyone (including his own) expectations. Mickelson’s short game display in winning the CA Championship last month was out of this world. If he can reproduce that at Augusta, we’ll be in line to see some stunning creativity around the greens. Tiger’s long game and clutch putting vs Phil’s endless arsenal of chips and pitches…. Could there be a shoot-out down the stretch? Here’s hoping. Rory McIlroy – No young player since Tiger has arrived at Augusta surrounded by such hype. The cynic in me should be feeling it’s all been blown out of proportion, but even he can’t help thinking the Northern Irishman is actually rather good. I can’t wait to see how he deals with the subtle nuances of Augusta. European hopes – There are currently five Europeans in the top-10 of the World Ranking. Surely this could be the week for the first European winner since Jose Maria Olazabal in 1999. 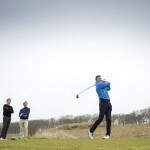 My tip – Henrik Stenson. Billy Payne. – The Augusta chairman has made some subtle changes to the back nine in an attempt to “bring back the roars,” the closing stretch was so famous for. Hopefully this year we’ll see more eagles at the 13th and 15th and, at least, one man making a charge through the field over the final nine holes. Greg Norman – After his incredible third place finish at Birkdale last year, the Great White Shark has earned his first invite to Augusta in seven years. I followed him during his second round in the 2008 Open and he was still captivating to watch. I can’t wait to see how he gets on this week. Gary Player – He’s announced this will be his last Masters so, from next year, we won’t have to watch him struggling round in 82 while the commentators repeat every five minutes, “He regularly beats his age in bounce games.” It’s fantastic for a man of his advanced years to play such great golf, but is a Major championship contested around a 7,500 yard course the right place for him? Drew Kittleson – Who? Well yes, I asked the same question when I drew Mr Kittleson in the Masters sweeper at my home club. It turns out he was runner-up in last year’s US Amateur so received an invite. He’s currently 300/1. OK, so I’m not that excited about Drew Kittleson. Anyway, coverage of Amen Corner starts on the internet in six hours so I’m off to put on my golf shoes and set up a putting course between the piles of paperwork strewn across my office floor.